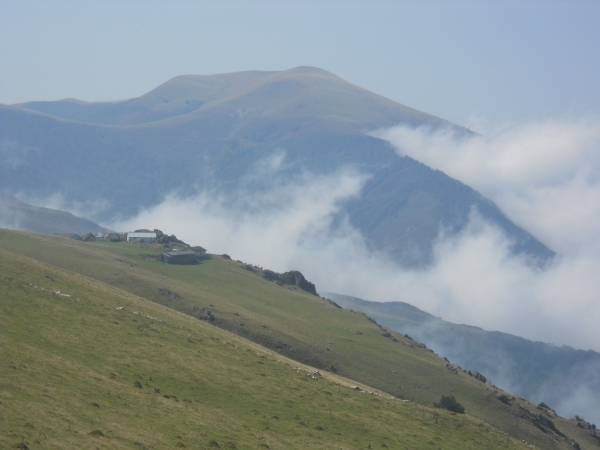 Another Long Walk: Day 26: Over the Pyrenees and Into Spain! A pilgrim pack outside of a gite. 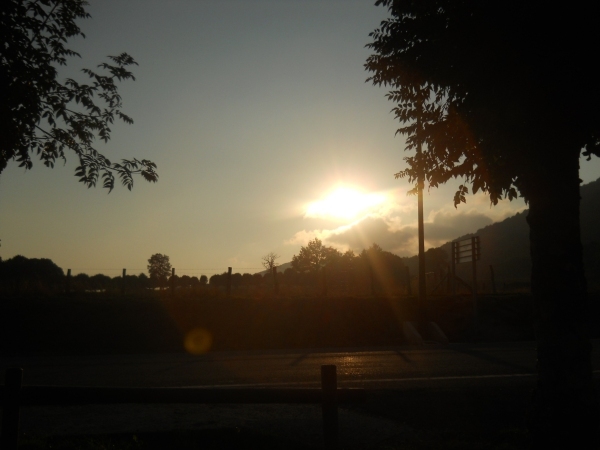 September 6: I woke up bright and early, took a shower, ate breakfast in my room, and felt oddly anxious to get going. 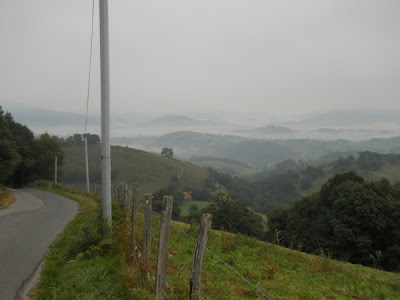 I'd been looking forward to this day for a long time--over the Pyrenees and into Spain! The trail out of Saint-Jean-Pied-de-Port followed along a steep, paved road late in the morning. 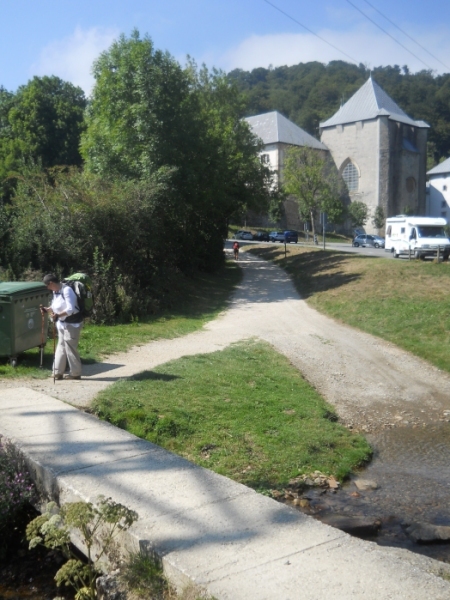 There are few places to break up the 28-kilometer hike between Saint Jean and Roncesvalles--quite a long haul for most of the pilgrims who would be starting their first day. 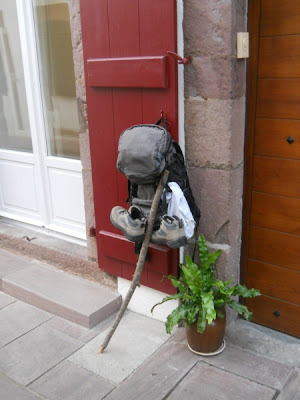 Consequently, I assumed I was bringing up the rear of the mass of pilgrims leaving Saint Jean. They needed to start early to get over the hump and cover the distance to Roncesvalles. I, having already hiked over 700 kilometers, was in fantastic shape, and considered a mere 28 kilometers a "short" hiking day. In fact, only five other days on my trip were shorter. It really was a short hiking day for me! Had I still planned to push onto Lisbon, I would have covered a lot more distance. But I wasn't in any rush now. Nope. I was going to take my time hoofing it over the Pyrenees. Coming out of town, a tall Irishman caught up with me. He slowed down to chat for a few minutes, which is how I learned he was from Ireland. "Jack, from Ireland?" I jokingly asked--a reference to The Way that he didn't seem to get. I realized this when he started to explain to me that Jack wasn't really a very common name in Ireland. Then he picked up his stride and pushed on beyond me. He was the only person to hike faster than me all day. Oh, sure, others passed me at times when I sat down to admire the views, or stopped to eat a snack, or slowed down to talk to others along the trail. But then I'd get up and keep on at my own pace and quickly catch up and pass them again. 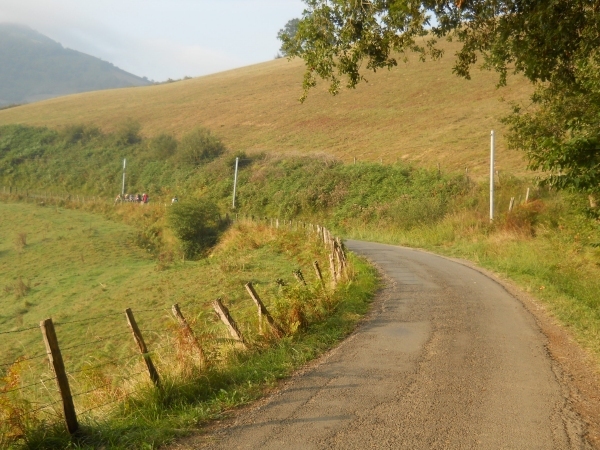 I was the rabbit--not necessarily winning any races, but taking long breaks to admire the views and enjoy my time in the Pyrenees--while the turtles, tired and exhausted, plodded onward. I talked to a lot of people along the way too. English, it appeared, seemed to be the most common language of the trail. I had people to talk to. A lot of people to talk to! 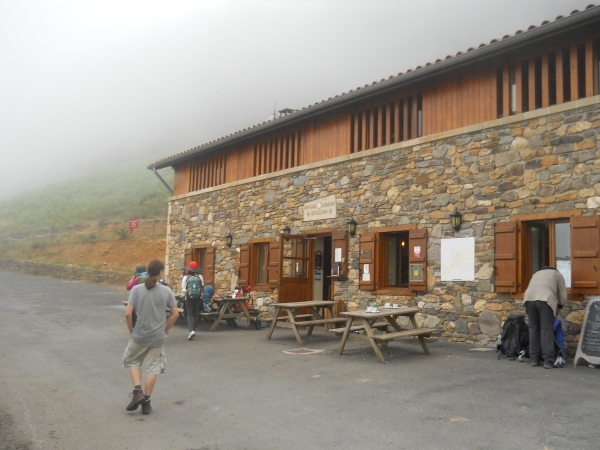 It was a welcome change from the relative loneliness since Le Puy. A surprisingly large number of them were Americans. I read that about 5% of the people who hiked this trail were American, but my informal numbers suggested a much higher percentage and I wondered how much The Way had to do with that. In addition to the Irishman--who I quickly caught up and passed when he slowed down to walk with a cute girl from Brazil--I caught up with Charles (the New Zealand priest that I ate dinner with two nights before). He was quite surprised to see me since he thought I had gone over the Pyrenees the day before, and I explained my decision about cutting Lisbon off my hike and that I decided to slow things down instead. I also passed a large number of Asian-looking folks, most of whom didn't seem to know any Spanish or English, and naturally assumed they must be from South Korea. I don't normally assume Asian-looking people are from South Korea--Japanese tourists would usually seem like a better guess. But my earlier research on the trail highlighted the fact that a surprisingly large number of Koreans do hike the trail--even more than Americans do (or did). Apparently, someone hugely famous in South Korean had hiked the trail then wrote a bestselling book about his experiences, and ever since, the trail had become a mecca of sorts for South Koreans. One of the Koreans, I was amused to note, appeared to be carrying a bear bell. There aren't a lot of bears wandering around in Europe, and it was not pleasant to listen to, but I pushed on ahead up the mountain and didn't have to listen to the clutter of those bells for more than a couple of minutes. I also met two young girls from Israel that spoke no Spanish or French--just English and Hebrew. I told them "Boker tov!" --Good morning in Hebrew and chatted for a few minutes before pushing on past them. I didn't ask about their religious proclivities, but I was more than a little fascinated why a couple of girls from Israel would be on a pilgrimage to Santiago. Now, I know the girls might not actually be Jewish, but let's face it--most people from Israel are and I had no reason to think these girls were exceptions. I wouldn't have expected to see any Israelis on the trail, and I found two within hours of leaving Saint Jean. I continued to great everyone I met with a hearty "Bonjour!" --at least until I learned their nationality at which point I'd tell them hello, boker tov, or buenos dias as necessary, which covered every language I knew how to greet people with. Well, that's not exactly true--I also remembered how to say 'good morning' in Swiss-German, but I never did meet any folks from Switzerland hiking the trail. It was easy to spot the non-French people when I said, "Bonjour!" --they would reply with their own bonjour, but it was always hesitant--like they didn't have the confidence to say it with gusto. I had no doubt I still butchered the word and my accent would never fool a native Frenchman, but I think it fooled everyone else! At least until I started speaking English. 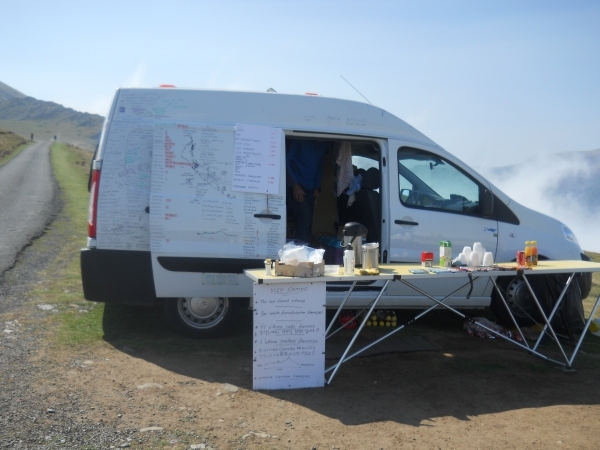 A place to stop for food, drink, or rest. 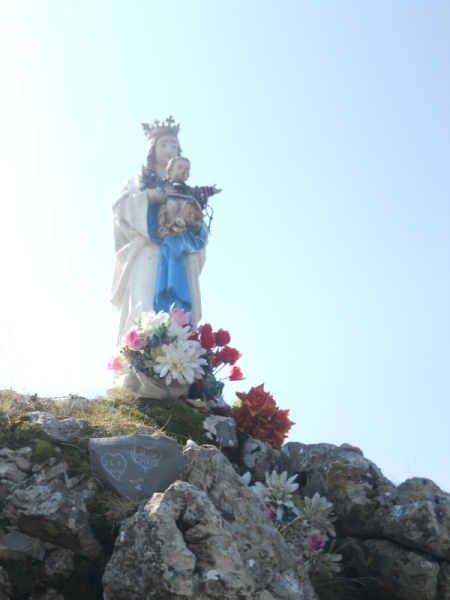 Near the top of the ridge, I reached a food truck selling drinks and food to pilgrims along the trail and claimed to have the "last stamp in France." The most fascinating thing about this truck was the writing on it. 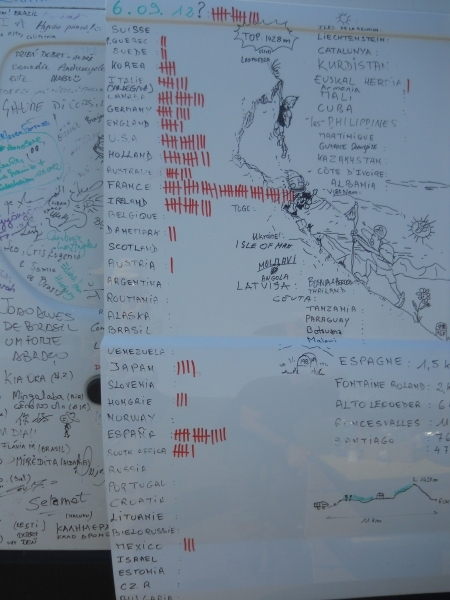 Many pilgrims had signed the truck, and the side of it contained a long list of countries that ticked off the nationalities of everyone who passed by during the morning. I told the proprietor that I was from the United States and he added a mark next to the appropriate row. I bought a Coke and had him stamp my credential, then laid out and admired the views through the now-patchy clouds. I felt on top of the world. 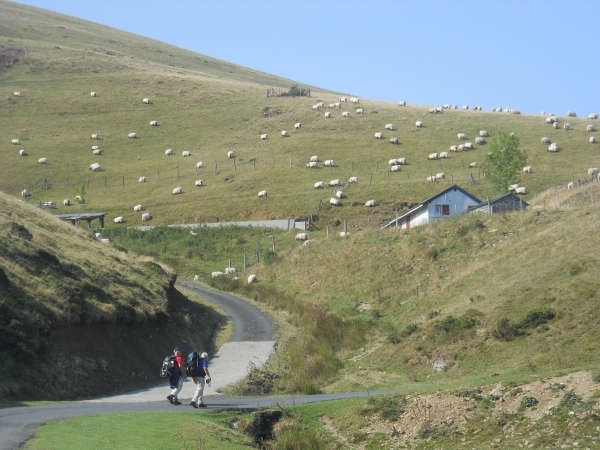 Sheep dotted the hillsides and hikers dotted the roads. 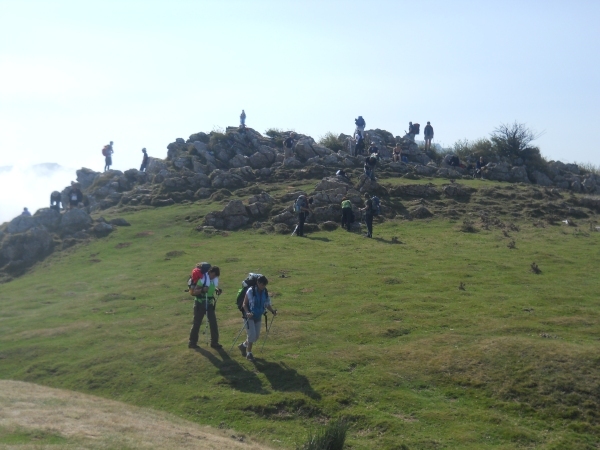 I knew this was the world's most traveled trail--in 2010, a whopping 272,703 people registered the completion of their hike in Santiago--but the sheer number of pilgrims still astounded me. At one decent viewpoint, I counted more than 20 hikers ahead of me along the road before it curved out of sight and another 20 hikers behind me before that direction curved out of sight. It was a busy little trail! I continued hiking, up and up. 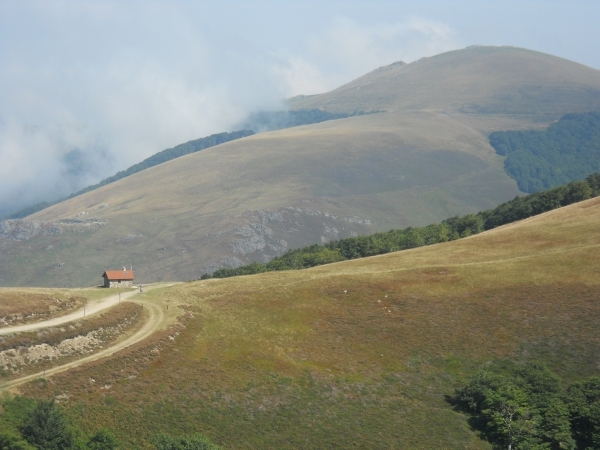 The initial steep ascent leveled off into a gradual ascent, climbing above the clouds and into spectacular views. Okay, not High Sierras spectacular, but it's own special beauty. At the highest points, a ferocious wind blew over the ridge tops and I had to secure the strap of my head tightly around my chin to keep it from blowing away. 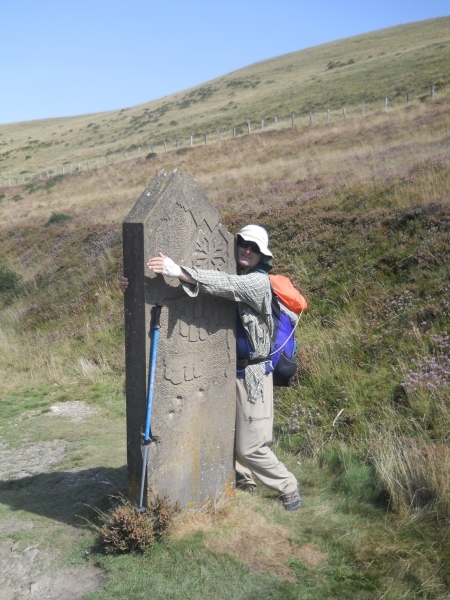 I twirled my trekking pole in the air with joy. Life was good! 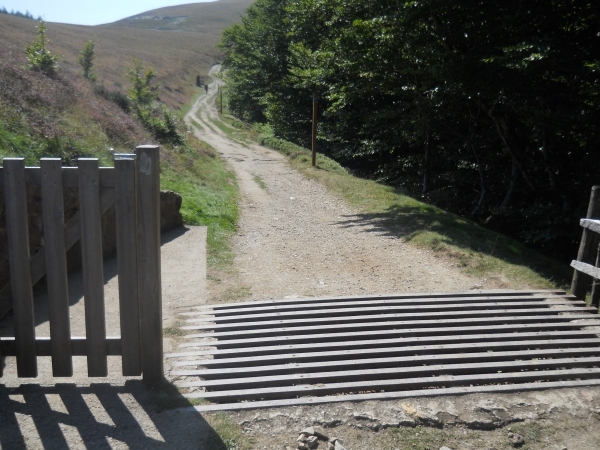 Near the top, I knew I was getting close to the Spanish border--marked by a cattle crossing. 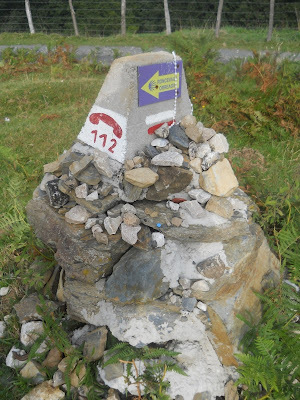 A water fountain was just on the French side of the border, and a rock monument was just on the Spanish side of the border, but the actual border, I was told, was marked by nothing more exciting than a cattle guard. People could walk between the countries without any border patrol or checkpoints, but heaven forbid, the cows and sheep certainly wouldn't be allowed to wander between countries at whim! The clouds and fog are finally starting to burn off! 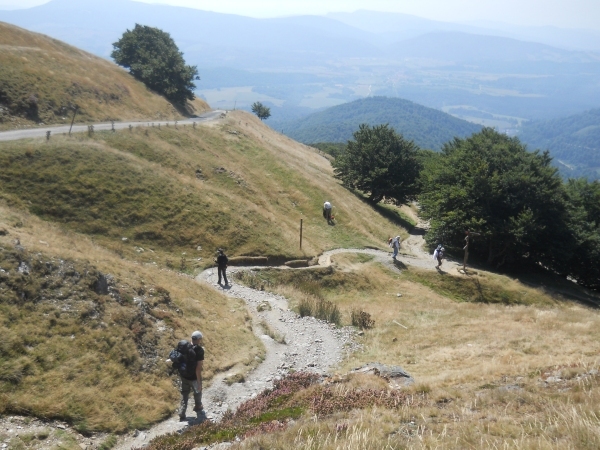 The trail eventually reached the highest point over the Pyrenees, then proceeded to crash steeply through a forested slope towards Roncesvalles. 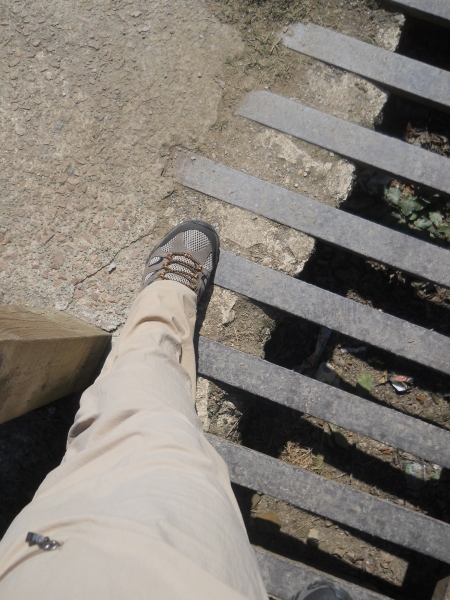 It was quite steep over loose rocks and I had to slow down or risk a seriously ankle or knee injury. Near the bottom, I started to tear based a woman, wishing her a "Buenos dias!" but got the sense that she was having trouble and slowed down to talk. I asked where she was from--Australia--and how she was doing. She had a hiking partner who had left her behind, though, which she was a little bitter over. And, this late in the day, was feeling the pain of the downhill slope and distance that had been covered. I had met others on the trail who were hurting--physically, at least--but this one seemed to be hurting more internally and I felt bad for her. I wanted to cheer her up. 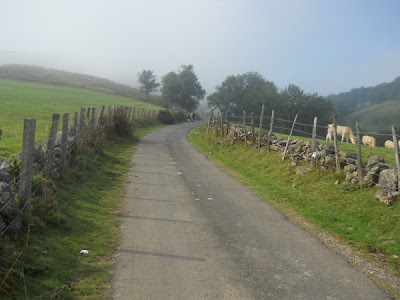 The camino should be a fun adventure, not a miserable slog. She asked if I could get her water bottle out of her pack which I happily got for her, then returned it to her pack afterwards, and I walked with her the last kilometer or two into Roncesvalles just chatting and her mood seemed to improve. We walked into town together, and I formally introduced myself and she introduced herself as Vivian. I didn't know it at the time, but I'd be seeing a lot more of her before our hike was done. When she caught up with her friend in town, she introduced me as an "angel" for having gotten her water for her. She must have been feeling really down if that's all it took to make oneself an angel in her book! I checked into the alburgue in town that could host about 200 people at once. The sheer size of the place kind of intimidated me--the gites I passed never held more than a dozen people or so at a time. Something of this scale was completely beyond my comprehension, but I was curious how it all worked and made a point of staying there rather than camping out. The guy who checked me in asked for my passport, which I handed over. Upon noting that I was American, he asked if I would get back to the United States before the election. "I give you a good bed, then!" "Uhh... thanks," I told him. =) He stamped my credential and assigned to me bed #248, a top bunk on the "second" floor of the building (third floor if your American). Let it be known, I suppose, that bed #248 is considered a "good" bed, but to be perfectly honest, I'm not really sure what makes it any better than any other bed in the alburgue. I picked up my pack and left by saying, "Merci!" then quickly correcting myself and said, "Gracias!" I was in Spain now. I had to stop using French! For several days, I found myself speaking French instead of Spanish. Oui instead of si, or bonjour instead of buenos dias, and merci instead of gracias. It's a tough habit to start, and it was a tough habit to break! When I say that sheep dotted the hillsides, it was not a figure of speech! 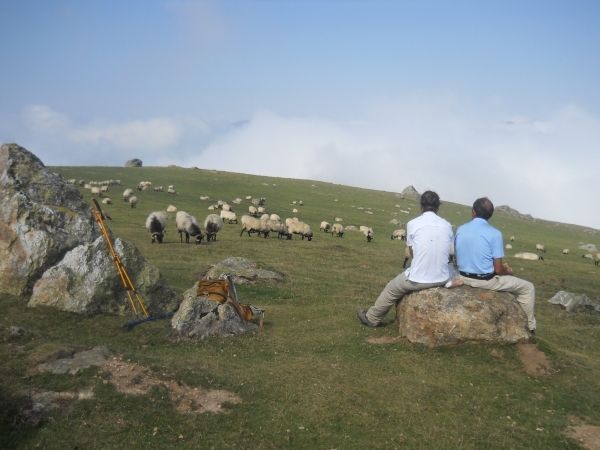 These pilgrims decided to stop and smell the sheep! The views really were quite wonderful! 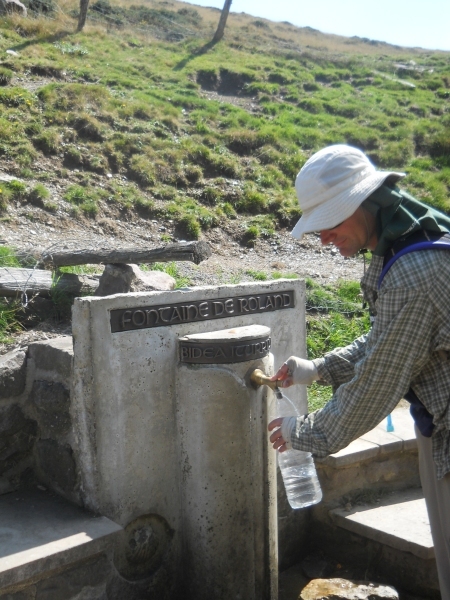 The Fontaine de Roland--and my last French water source. That's Spain on the other side of that cattle guard!!!!! Oh, Spain! How I love thee! A shelter--I guess in case hikers get caught out in storms? desperate to take shelter in that thing! drop into Roncesvalles at the valley bottom. 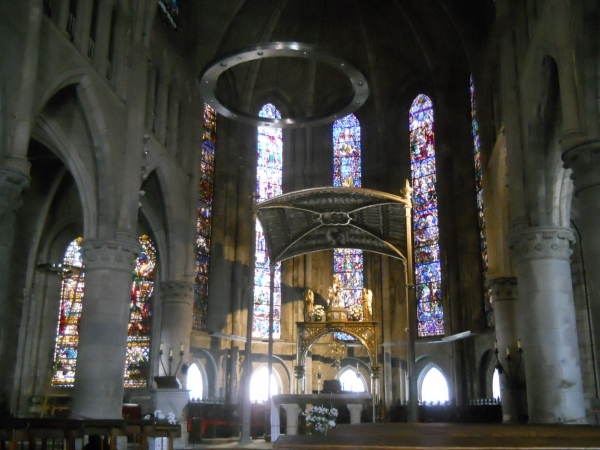 Inside the church at Roncesvalles. 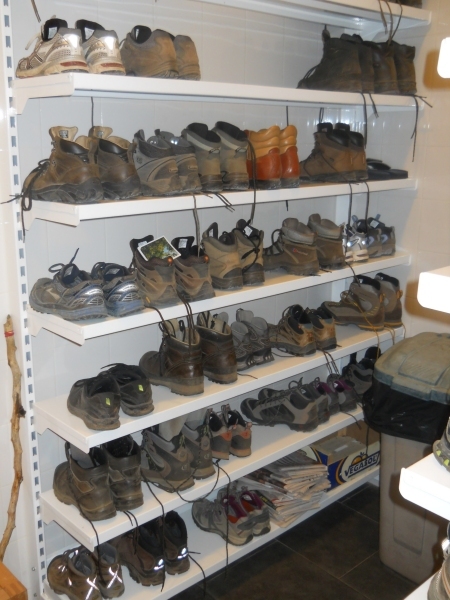 Some of the racks of shoes at the alburgue. "I had to secure the strap of my head tightly around my chin to keep it from blowing away." I've been there myself a time or two.